Kate Bosworth is currently in New York to promote her new film 'Nona' and yesterday(December 5th) she stepped out in several different look for some appearances. 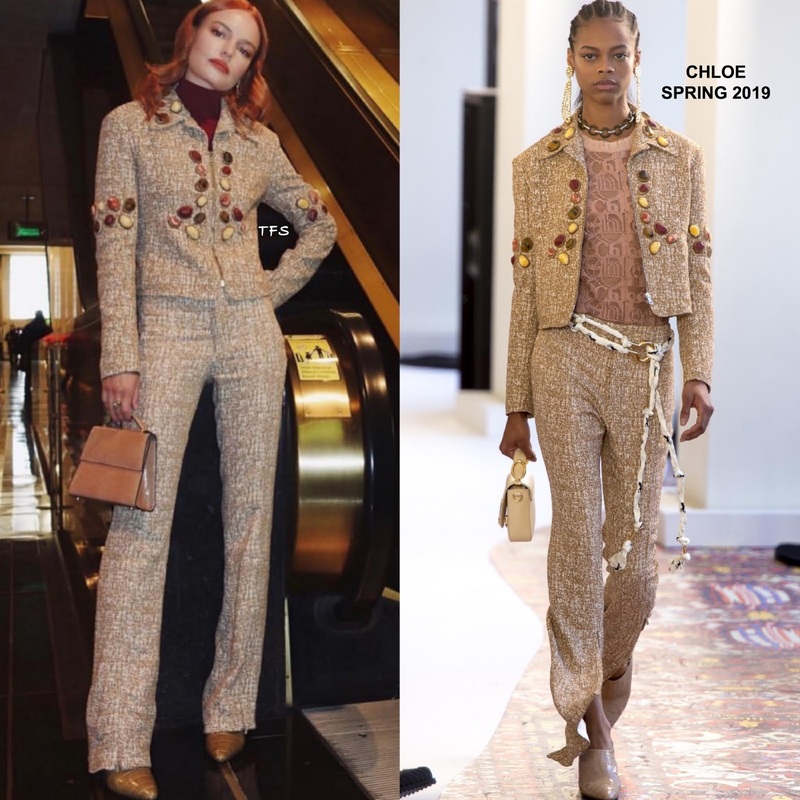 For Live with Kelly & Ryan, she was in an earth tone sorta mood, wearing a CHLOE SPRING 2019 embellished jacket with a brown turtleneck underneath and the matching trousers. She accessorized with a HUNTINGSEASON bag and brown pumps which topped off her look. For the Build Series, she wore another CHLOE look but from the RESORT 2019 collection. Her cream silk dress was adorned with horses and featured long gold & white lace panel sleeves. Her dress was accessorized nicely with a green bag and brown tie around pumps. For the Seth Meyers show, she wore a SALLY LAPOINTE PRE-FALL 2019 black papaya metallic jersey twist top & high-waisted zip-front pant. The pieces are cute and she looked great but the pants needed to be hemmed. For SiriusXM Studio, she wore a casually chic ensemble which featured a CHRISTOPHER KANE RESORT 2019 red embellished top and frayed hem jeans which she accessorized with a CHLOE bag and CALVIN KLEIN embellished sandals. On her way to a SAG AFTRA panel, she slipped into a 3.1 PHILLIP LIM SPRING 2019 black dress, featuring a crisscross cutout waist and a carwash pleated skirt. Her look was topped off with a red lip, white sunglasses, a HUNTINGSEASON bag and white heels.